Kraemer completed the rehabilitation of the Wisconsin Avenue Lift Span Bridge and the demolition and reconstruction of the Juneau Avenue Lift Span Bridge over the Milwaukee River. This was the Wisconsin Department of Transportation’s first use of the design-build procurement method. All mechanical, electrical, and hydraulic control systems were redesigned and upgraded to current technology including the first-ever use of a double corrosion protection reinforcing bar by the Wisconsin Department of Transportation. Updated systems on the Wisconsin structure were carried over and used in the Juneau structure. 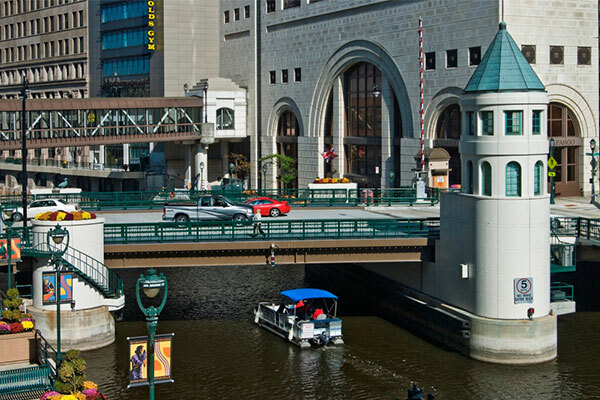 Significant emphasis was placed on the structures aesthetics, which included concrete staining and decorative painted steel pedestrian railings, because of the bridges downtown location adjacent to the city’s pedestrian-friendly riverwalk.